It’s amazing how far a couple of hundred feet is when you haven’t walked for days. When we finally arrived at Diane’s home, our friend in Erie where Danelle was staying, I made my way up the lovely serpentine walkway to their home. Though Danelle denies it, I’m sure I looked a lot like the “little old man” always depicted by Tim Conway on the old Carol Burnett Show, shuffling along the sidewalk careful not to fall. I climbed the four steps to the porch, holding onto Danelle’s shoulder for stability and entered the house. It smelled like somebody’s home. No more clinical disinfectant, just that clean smell of lemony Pledge and home cooking. I shuffled to the bedroom while Danelle gathered my toiletries and put them in the shower. It dawned on me that, with the exception of the occasional sponge bath, I had not really showered since Sunday morning…gross! 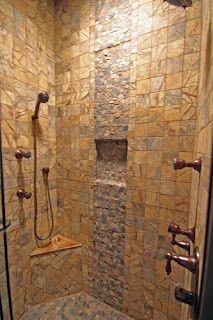 Shower was very similar to this one. water on and entered the glass doors. For long minutes I just stood there, water running down my face. There is nothing like a hot shower on a tough day. It seems to not only wash away the grunge from your body, but also the stains on your soul. I think that's because it intuitively reminds those of us who are Christians of our baptism. How that simple act of ritual washing symbolizes the removal of the stain of sin on the inside of our soul. The water refreshes, renews, and restores life. That night in that raindrop shower, tears mixed with the soapy water as the pent up emotions of the previous few days washed over me like a tidal wave. In that moment I just gave everything over to Jesus, knowing that by His stripes I was already healed. Danelle says men are horrible criers because we don’t get enough practice. I am sure she is right; I really stink at this whole crying thing. There are times when you don’t care whether you are good at it or not, it just has to come out. When I was at ECU in the School of Social Work, one of my clinical advisors used to say about clients crying, “simply remind them that tears on the outside wash away, tears trapped on the inside stay and stay.” I am not sure I ever fully understood this concept until that night. Somehow the waters of the shower mixed with my tears seemed to wash away some of the anxiety and fear. It drowned some of the disappointment at everything I would miss and seemed to affirm the voice of God in my heart that my wife would be loved and my family cared for even in my absence. Somewhere in the night my prayers were heard and I fell into a deep sleep that would not be interrupted by IV alarms, the need to take vital signs, or the labs coming to take more blood. I could finally rest because God assured me that He had it under control that night and I could just let it all go…and I did, well at least for a few hours. Gracious God, you remind me with every shower that your forgiveness washes away the trials and transgressions of my life. I know that when I cry, you cry with me, that You are present in the darkest places of my life to shed the light of hope upon me. Thank you, Jesus, for going with me into the valley of the shadow of death. Amen.